"Femi makes three, you know. Three and they label you a serial killer." Korede is bitter. How could she not be? Her sister, Ayoola, is many things: the favorite child, the beautiful one, possibly sociopathic. And now Ayoola's third boyfriend in a row is dead. Korede's practicality is the sisters' saving grace. She knows the best solutions for cleaning blood, the trunk of her car is big enough for a body, and she keeps Ayoola from posting pictures of her dinner to Instagram when she should be mourning her "missing" boyfriend. Not that she gets any credit. Korede has long been in love with a kind, handsome doctor at the hospital where she works. She dreams of the day when he will realize that she's exactly what he needs. But when he asks Korede for Ayoola's phone number, she must reckon with what her sister has become and how far she's willing to go to protect her. 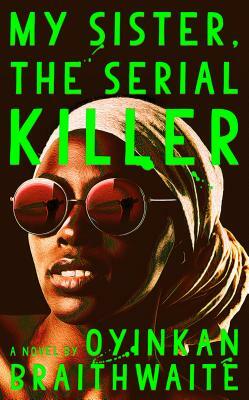 Sharp as nails and full of deadpan wit, Oyinkan Braithwaite's deliciously deadly debut is as fun as it is frightening.